So I have a gift for spotting breweries. 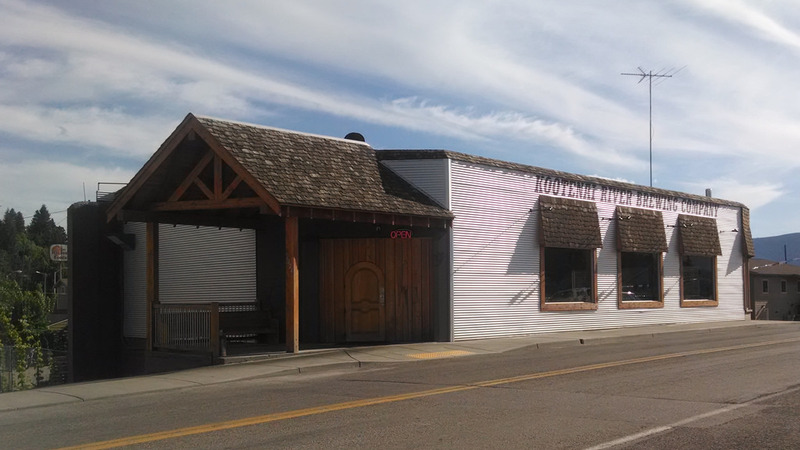 This is what happened with Kooteani River Brewing in Bonners Ferry Idaho. It was like any other day that I had spent in Bonners Ferry, I stopped by the casino, made my donation and was looking for something else to do. And what better way to forget about loosing my dollars at the casino than throwing back a few beers. I have visited Kooteani River Brewing often and each time I am pleased with their beer selection as well as their view overlooking the Kooteani River. Their food menu is a typical pub style with reasonably priced items, with nothing over $25 USD and most around $15. I recommend the pulled pork sandwich. My last visit I stepped out of the norm and ordered a hamburger, hence the photo. The burger was not my favorite and when I return again I will go back to my regular pulled pork sandwich. I am a creature of habit, I can’t help it! The restaurant is kid friendly along with some dedicated food items on the menu for them. Kooteani has a consistent line up of beers that may lack flashy names, but that is really the only thing they are lacking. My favorites are the Pale Ale, a 37 IBU (international bittering units) with a 5.9% ABV (alcohol by volume) and the IPA, a 64 IBU and a 7.2% ABV. I also like the Rye Pale Ale, with a 35 IBU and a 5.3% ABV. There are rotating seasonal taps as well that are always worth a try, I have yet to find one I haven’t liked. 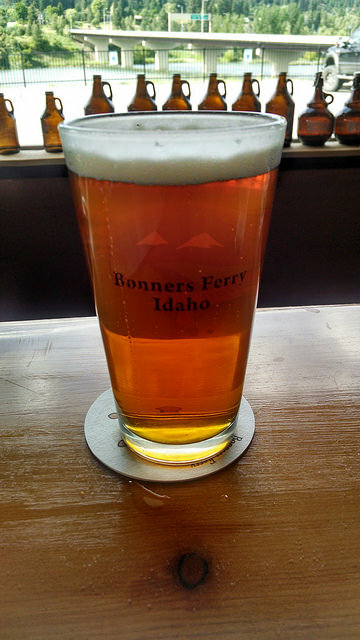 If you want to get the total Idaho experience give the Huckleberry Wheat a try, made with local huckleberries and local hops. If you have never had huckleberries before, they are similar to blueberries but tart. The brewery is outfitted with both inside and outside seating. Both have their perks, the outside seating is great for a nice day whereas the inside seating has a nice view of the river and mountains. If you do choose inside seating there are several TVs with sports on that can be viewed easily from the bar, pub tables or dining room tables. 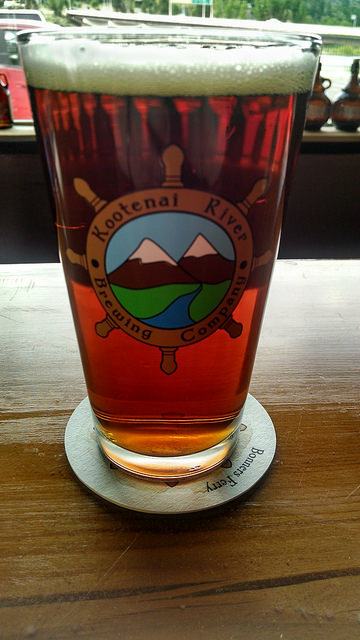 Want to check out the Kooteani River Brewing in Bonners Ferry? They are located at 6424 Riverside Street and open daily from 11:00 am to 9:00pm. 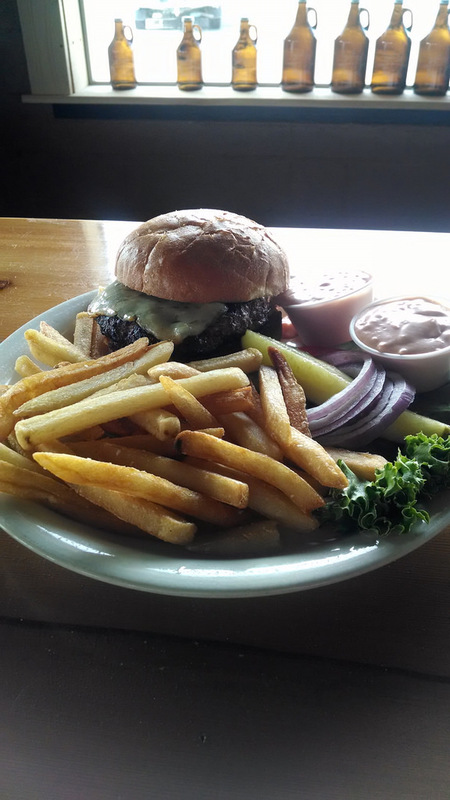 Looks like a solid place to eat and drink … great review! I enjoy it every time I go!